You are here: Home › Blogs › Community › Boing Boing's Cory Doctorow will speak at LibrePlanet 2017: Register to attend today! 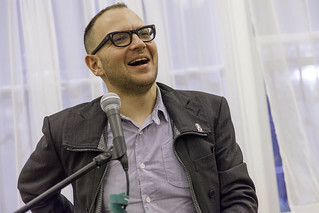 Boing Boing's Cory Doctorow will speak at LibrePlanet 2017: Register to attend today! Guess who is coming to LibrePlanet? Cory Doctorow is a science fiction author, activist, journalist, and blogger — and he will be one of the keynote speakers at LibrePlanet 2017: The Roots of Freedom, March 25-26, 2017 at Massachusetts Institute of Technology's (MIT) Stata Center in Cambridge, MA! Doctorow is the co-editor of Boing Boing and the author of a number of books — most recently In Real Life, Information Doesn't Want to be Free, and Homeland, the award-winning, best-selling sequel to the 2008 young adult novel Little Brother. His award-winning science fiction tackles issues relevant to software freedom, turning the theoretical risks of proprietary technology and copyright, ethical dilemmas of technology, and experiments in participatory culture into stories of very possible futures. Serving as a special consultant to the Electronic Frontier Foundation on several occasions, he is currently working with them on Apollo 1201, an anti-Digital Restrictions Management (DRM) campaign. He co-founded the peer-to-peer free software company OpenCola, and serves on the boards and advisory boards of the Participatory Culture Foundation, the Clarion Foundation, the Metabrainz Foundation and The Glenn Gould Foundation. At LibrePlanet, Doctorow will talk about "how we will kill all the DRM in the world in a decade." For the fourth year in a row, LibrePlanet — the Free Software Foundation's annual conference — will be held at MIT's Stata Center in Cambridge, Massachusetts, this time on March 25th and 26th, 2017. The Free Software Foundation's partnership with MIT's Student Information Processing Board (SIPB) has been key to making LibrePlanet a vibrant gathering of free software enthusiasts. The rest of the LibrePlanet program, including other keynotes, workshops, and sessions, will be announced soon. Don't miss out on Cory Doctorow and more! Registration for LibrePlanet is now open, and admission is gratis for Free Software Foundation members and students. Not a member? Join today for gratis admission to LibrePlanet and other exclusive benefits — plus, you'll help us meet our winter fundraising goal of $450,000 by the end of the year. Includes text adapted from https://craphound.com/bio/. Photo courtesy of Alex Schoenfeldt Photography CC-BY.